If you live in Miami and you’re lucky, your friends will make this when they invite you for dinner. If you head to my old stomping grounds on vacation, do me a favor and order it from Puerto Sagua in South Beach (I miss that place so much!). If you’re stuck at home like me, you’ll have to take matters into your own hands. 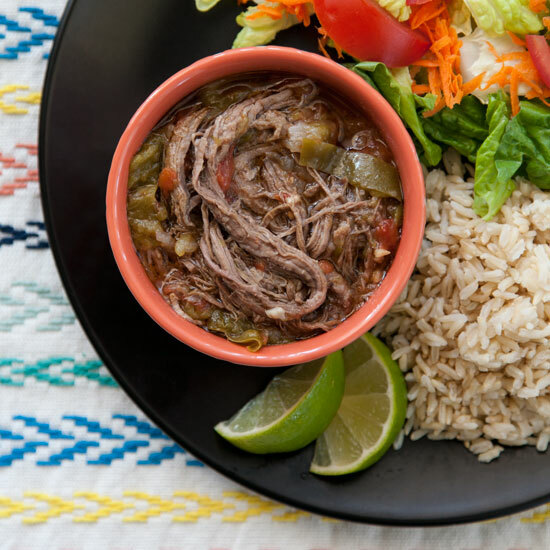 Luckily, a pressure cooker makes it pretty fast and easy to get your ropa vieja fix. It’s time to pull out Instant Pot and get cooking! When the meat has a healthy dose of golden-brown-delicious, set it aside and throw in some onions and garlic. Saute them for a couple of minutes before adding a cup of broth to deglaze all the tasty essence from the bottom of the Pot. After deglazing, we can add a can of tomatoes, cumin, oregano, a bay leaf, and a little sazón or adobo if you are so inclined, for the authentic Miami touch. We’ll also add sliced mild peppers. When I lived in Florida, I liked to buy cubanelle peppers for this dish, but I haven’t seen them for sale here in California. This time I chose Anaheims instead, which are pretty similar, but I don’t think quite as sweet. Use whatever you like – bells or any favorite varietals available near you. Cuban food isn’t typically very spicy, but you could also add any of your favorite hot chilies too. Mix it up, and nestle the beef back in to pressure-cook. Depending on the thickness of the steak, it typically takes about 40 minutes under high pressure to thoroughly cook a typical 2 lb. cut enough to easily shred. 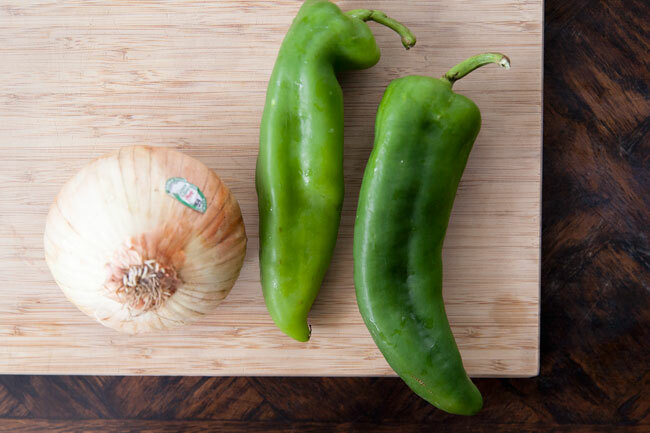 This length of time does leave the peppers very soft, so if you’re willing to take on an extra step, you may prefer to cook the peppers separately and add them back at the end. I’m defaulting to the above method for simplicity and because it does deeply infuse the pepper’s flavor. Just FYI – your choice! Yasssss. 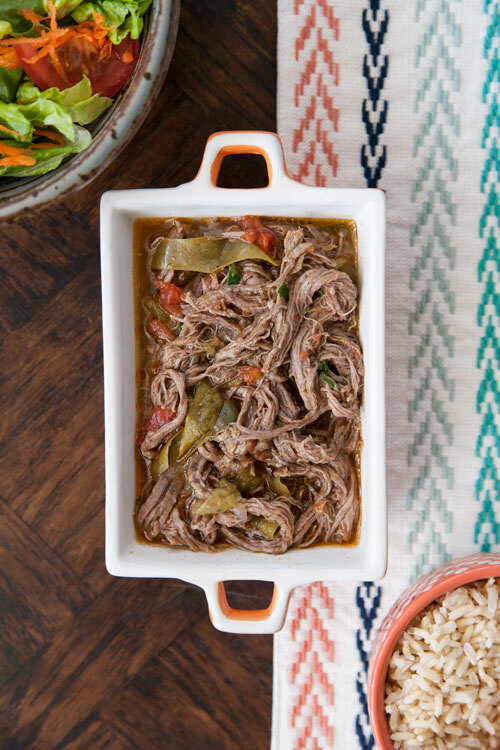 When you open the lid, your beef should need only some gentle tugging with your fork to collapse into ropa vieja perfection. If your cut was thick and the meat isn’t tender enough yet, cook for a few minutes longer and try again. This is an entree that likes to be served alongside a spread of Cuban fixin’s. You’ll probably want a fluffy bed of rice as a landing pad for savory spoonfuls of stew – I served plain brown rice here, but seasoned arroz amarillo is also a good pairing. A fresh salad is a nice touch to counter the richness of the main course. Black beans are always welcome on this table too, but my very favorite special side dish to include here are maduros – sweet, ripe plantains, sliced thickly on the bias and pan-fried – Dios mio! I make them rarely because frying is messy and it’s not always easy to find good plantains now that I’ve left south Florida (in Miami, you can even buy maduros ready-to-eat in the freezer section of the grocery store!) – but they are a true regional delicacy worth re-creating. Isn’t it wonderful that cooking gives us the power to take a culinary vacation? If you already have a sentimental attachment to this food like I do, you can cook your way down memory lane. If Cuban food is completely new-to-you, you have a new exotic locale to explore. Either way, use your kitchen to take a trip. Bon appetit & bon voyage! Nutrition Information (average values, products can vary; analyzed with unsalted broth + 1 teaspoon sazon but without additional salt) for 1/8 batch serving size: 250 calories, 12 g fat, 4 g saturated fat, 70 mg cholesterol, 500 mg sodium, 9 g carbohydrates, 3 g fiber, 3 g sugars, 25 g protein. Season the flank steak generously on both sides with salt and pepper. Add the olive oil to the pressure cooker to cook over medium heat (press the 'Saute' button to begin cooking at medium saute heat). When the oil is hot, place the meat into the cooker, taking care to ensure a large flat surface is in contact with the bottom of the pot. Brown the meat well on both sides, then transfer it to a plate to rest. Add the onions and garlic to the pot, and continue to cook over medium saute heat, stirring frequently, until the onions begin to soften. Add the broth and deglaze: take a moment to scrape any browned bits from the bottom of the pot. 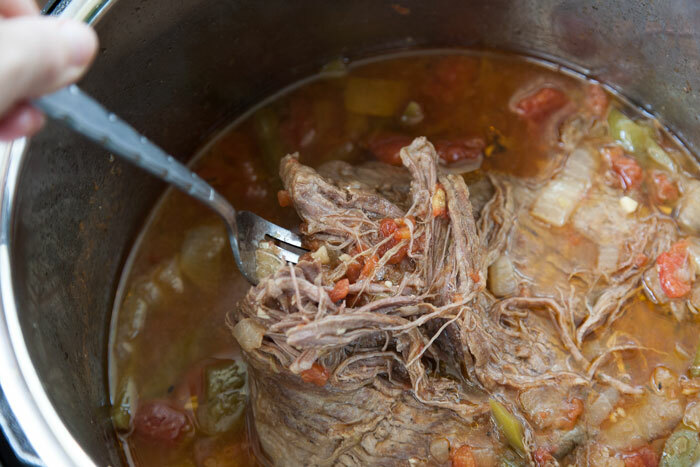 Add the canned tomatoes, sliced peppers, oregano, cumin, and bay leaf (and seasoning blend, if using); stir to combine, then nestle the browned flank steak into the stew. 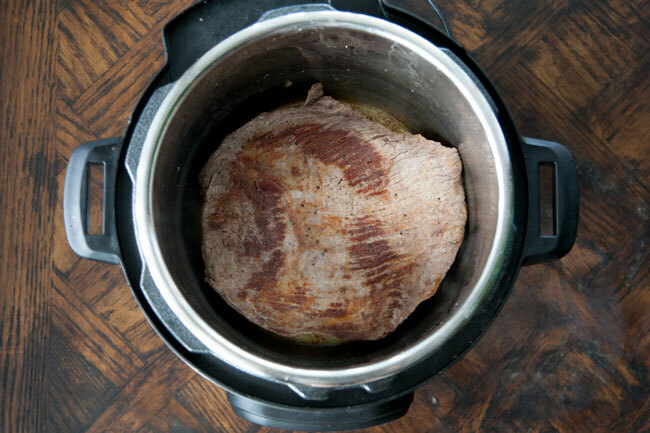 Cover the pressure cooker with the lid, ensuring that the valve is in sealing position. Cook under high pressure for 40 minutes (with Instant Pot, press ‘Cancel’ to stop saute mode before closing the lid, then press ‘Manual’ and "+" to select 40 minutes). When the cooking time is up, allow at least 10 minutes for the pressure to release naturally. Open the lid and carefully shred the meat by pulling it apart into long fibers with two forks. Discard the bay leaf, then mix in the parsley, vinegar and green olives. Season to taste, and serve with rice and your favorite Cuban-style accompaniments. Going to try this tonight. One wrinkle I’m adding is to blend the “sauce” together once its finished cooking. I’ll remove the meat temporarily and use a hand blender to blend the juices and vegetables together into a sauce then I’ll put the meat back in… Thanks for sharing this recipe. Excellent! I made this dish tonight and it was simple and delicious. Thanks for sharing. First dish to go into the instant pot. We should see in a few mins. I cooked 3lbs, so it took about an hour to get just right. Flavorful indeed. Skip on the last part of recepe witch called for the vinegar and chopped parsley and it didn’t matter. 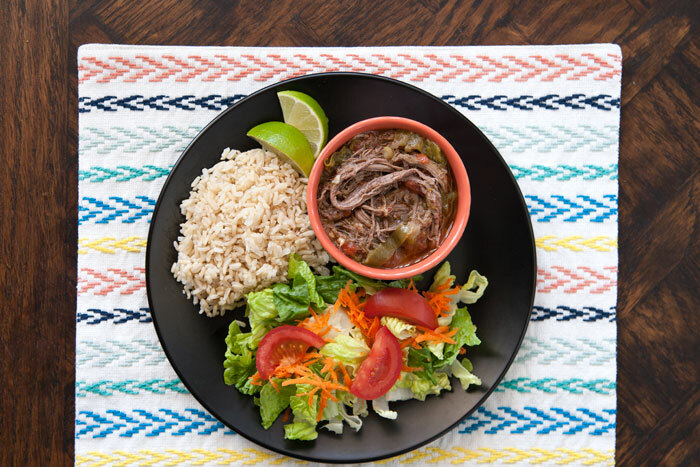 After eating ropa vieja a lot while on a recent trip to Havana, I had to try this at home. It did not disappoint!!! Thanks for posting!! 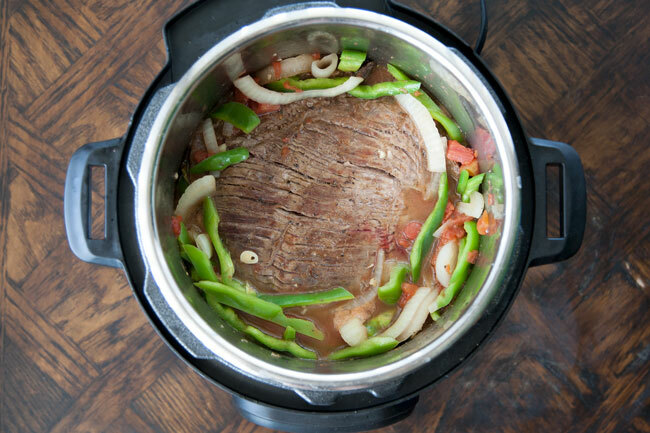 The valve sound always be set to “sealing” while pressure cooking – this allows the pressure to build up. Then the “venting” setting can be used to (carefully!) release pressure. What if my pressure cooker doesn’t have a sauté option? 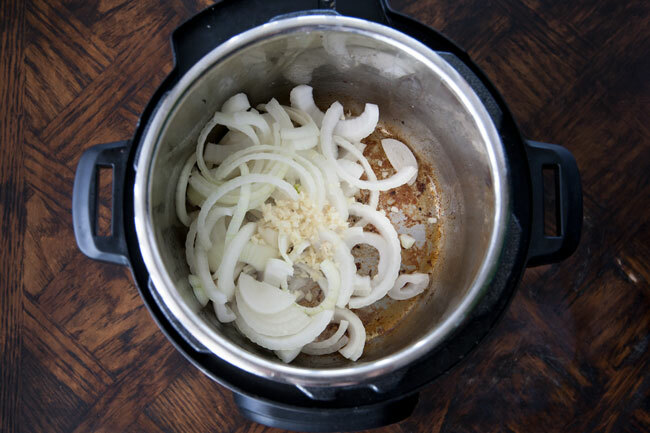 You can use another pot/pan on your stovetop to brown the meat and onions/garlic, up to the “deglazing” step. Then transfer to your cooker and continue the recipe from there. Just turn it on a timer setting and cook on it like you would on an open pot. Reset timer when you close lid. Just made this and it was delicious. I left out vinegar and olives. Husband is Cuban and he loved it. I will add tomato sauce next time for thicker sauce. I am from Cuba. I made this today and it was as close as my mom’s recipe. We didn’t use vinegar in ours but not bad at all. Ahh what a nice compliment, muchas gracias! 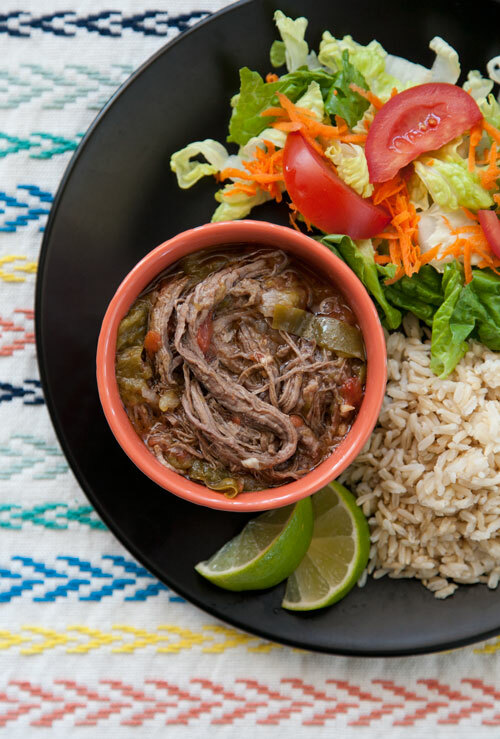 I need more Cuban food in my life – do you have any other favorite recipes I can try in the pressure cooker? I made this for dinner tonight in my Pampered Chef Quick Cooker. I followed your recipe exactly until the end when I forgot to add the vinegar and olives. I forgot because it already smelled so amazing and my husband said his mouth was watering. So anyway we all gobbled it up, even my daughter had 3 servings. Thanks for sharing, great recipe! Thank you! I think I made that same mistake the last time I made a batch of this, ha! How long should I cook it if it is only one pound of flank steak? I generally don’t change pressure-cooking times based on the batch size – I would try the same cook time. You got it! Just analyzed and added to the recipe notes. Next Next post: Making a Move… Hello, Seattle!